Just 20 miles from Dallas, Terrell, Texas offers small town charm with the convenience of being near a big city. Its historical charm resonates in the turn of the century architecture of early churches and public buildings. Historical tours of this former depot town are conducted in period dress, providing a true experience of life in the city's beautiful old homes and vintage buildings. 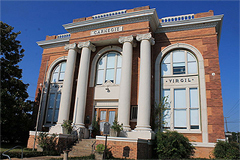 The Terell Heritage Society Museum is now located in the former home of an origianal Carnegie Library (pictured above, left). Be sure to stop in to see displays of artifacts pertaining to the the rich history and cultural heritage of Terrell, Texas and the surrounding area. Companies looking to expand or relocate find Terrell's progressive approach to economic development an attractive alternative. Tax abatement and other financial incentives have encouraged the development of employment opportunities in a range of industries, from healthcare to all types of manufacturing. Also progressive is Terrell's approach to education, as seen in the Terrell Independent School District (or TISD), a fully accredited education program designed to raise the bar in education by setting high standards for its profressional staff and providing outstanding academic programs for its 4000 students. Terrell is also home to campuses of Trinity Valley Community College and Southwestern Christian College. Terrell, Texas offers a mix of entertainment opportunities including historical sight seeing, shopping in the historical downtown area or the Tanger Outlet Center, as well as several outdoor activities. Terrell is surrounded by some of the best fishing in Texas, home to the largest catfish in Texas (104 pounds) as well as eight of the top 10 largemouth bass caught in Texas.